I am an insulin dependant diabetic. Most people I meet, know someone who has diabetes. Hands up if that is you! It is not surprising as there are 1.8 million people in the UK with diabetes. 1.5 million have type two diabetes that can be controlled with diet and pills. The remaining 230K have what is known as type one diabetes and that is controlled with insulin injections. It is a complex condition that has a tendency to confuse people; even those who are closest to a diabetic. What’s more is that it is often badly portrayed on TV. Only this weekend I watched a youngster recover from low blood sugar with an orange juice (correct!) and an insulin shot (incorrect!). I would like to cover what type one diabetes is and how it can be controlled. For the rest of the presentation I will only refer to it as diabetes not by its type! Let’s start with the pancreas. 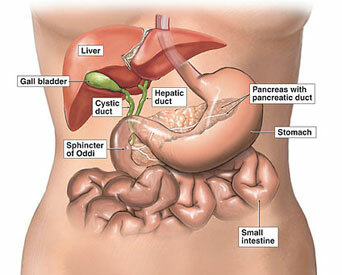 The pancreas is the organ just below the stomach that sorts out all digestive enzymes. Whatever you eat the pancreas excretes the right enzymes to enable absorption of the nutrients through the digestive system. One of the enzymes that the pancreas produces is insulin and this allows absorption of sugar into the living cells. Sugar is vital to the health of all animals; all living cells use it as a source of energy. Too little and the brain shuts down, too much and the body produces a deadly poisonous acid. So for diabetics the pancreas has stopped producing insulin all together. O-oh! Unfortunately: the make up of the pancreas makes it extremely difficult to transplant with only limited and short-term success. Insulin can not be taken orally as it is destroyed in the stomach acids before it gets to the duodenum. So at the moment the only reliable alternative is to inject insulin into the subcutaneous tissue. The difficulty the diabetic has is balancing the right dose of insulin with the amount of sugars consumed. In a healthy human, blood sugar levels out at between 4 and 6 (Five then) and this happens automatically. So the more sugar that is ingested the more insulin is injected. Each of these items has a sugar content. A pear has about 10 grammes of sugars, Do you think a tomato has a higher or lower sugar content? A glass of red wine higher or lower than the tomato? A portion of baked beans higher or lower than the pear? 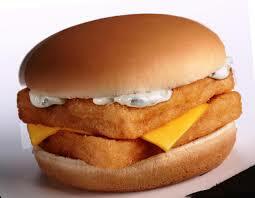 Filet-o-fish or Bacon double cheese burger? Whilst the Bacon Double cheese burger has a mere 29g. There are many reasons why blood sugar levels can vary, unusual energy levels or infections for example but mostly it is down to human error. You can see how easy it might be to get it wrong. When the blood sugars are high you tend to drink a lot through thirst, wee a lot because you have drunk so much and get horrid boils. Thing is with high blood sugar levels is not very dramatic and most times this is not depicted on TV. Whilst low blood sugar levels can be seriously dramatic. I remember collapsing in Dorchester high street just after Christmas. The left side of my body gives way if I let my blood sugars get too low. I sat on a door step and ate a chocolate bar – but knew that wasn’t enough so after a while I wandered into a bakery to buy a cake but because my brain was starved of sugar I was unable to communicate properly and the woman behind the counter refused to serve me. I assume she thought I was a drunk or on drugs. Another time, more recently my husband awoke at three in the morning to find me unconscious. It took him four hours to get me back to normal through glucose infusions and force feeding me mars bars. YUK! Sadly, even with the medical advances, I am still likely to die a good ten years before I might if I didn’t have diabetes. But I don’t want you to feel sorry for me, a whole bottle of red wine has less sugar than a single tomato AND a hundred years ago I’d have been dead before I got to my 20th birthday.